It was raining hard outside on July 4, 2017. I was in my home at the city of Kameoka, KYOTO and felt like delay the day for setting out for researching field. I looked at weather forcast in yahoo site and found the large cloud pouring the hard rain is moving out of Kyoto district around 8:00 pm. I put researching tools in a big box for sending to Shari Town located close to the volcano. In the box, I put five electrodes and four litters of copper sulfate solution (CuSO4) for Selp Potential survey, rulers, compass and so on and brought it to a post office. I waited for rain to stop. At 7:00 pm just as Yahoo Weather Forcast told, it really stopped and I left home by my motorcycle at 7:15 for Maizuru Port to take a boat bound for Hokkaido Island. 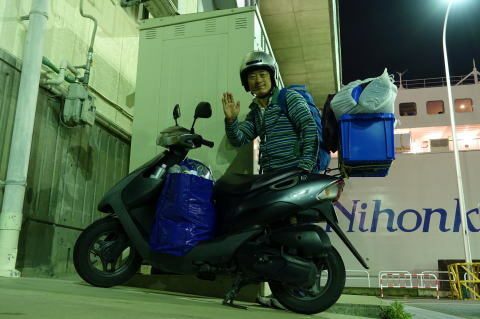 A huge amount of luggages are on my motorcycle. I will stay at Shiretoko Peninsula for a month so I need such amount of luggage. At 11:50 the boat left Maizuru Port while starting to draw a 1000 km wake behind.